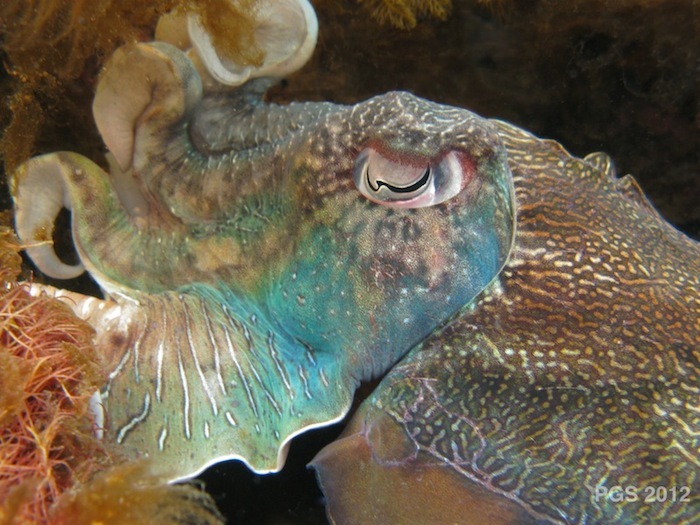 This is a blog about cephalopods, but one species will often be center-stage. That species is, of course, the Giant Cuttlefish itself, (Sepia apama), pictured in the banner above. 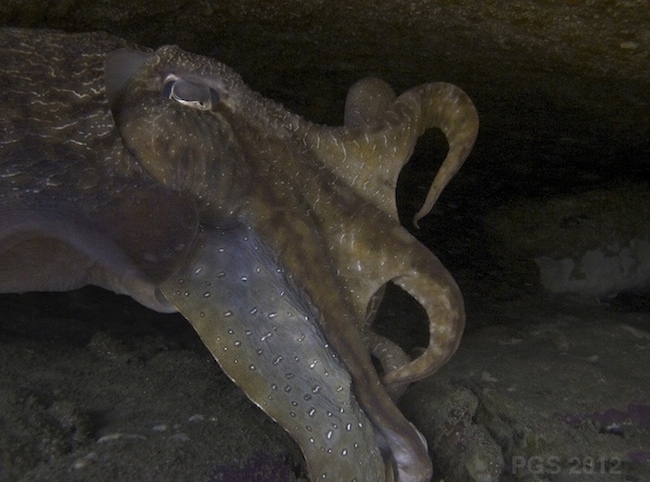 At first encounter, a Giant Cuttlefish looks like an octopus attached to a hovercraft. There is a recognizable head, with long arms coming off the front of it. A cuttlefish has eight of these arms plus two other “feeding tentacles,” which are usually tucked away out of sight. After getting over the octopus-meets-hovercraft shape, the next thing that one notices is their colors. 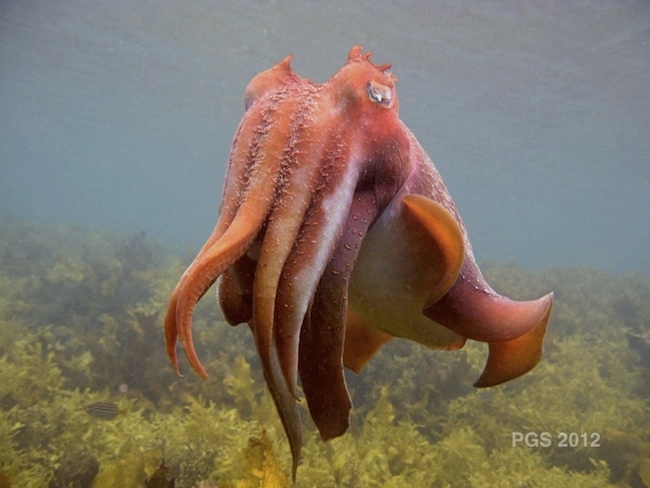 If you had to give a “base color” for Giant Cuttlefish, it would be red, as in the picture above. Red is the color you most often see when they are swimming about. But these animals are constantly, kaleidoscopically, changing their color, from reds through oranges to yellows and grays, with blues and greens seeping back and forth, and sudden shocks of dark olive. Their skin, as I said in the first post, is a living video screen, and it is not merely a “flat screen,” either, as the animal can fold, twist, and bend it as the color changes go on. The sports-car-red cuttlefish above is from Sydney. The one just below is from Whyalla, a town at the bottom of Australia that the Giant Cuttlefish seem to have chosen as their capital city. The black object shaped like a curved “w” is the pupil of the cuttlefish’s eye. Giant Cuttlefish are big animals, growing to about three feet (a meter) long. This is the largest of all cuttlefish species. The red one above was probably not far from three feet long. Perhaps in part because they are so big, many of them are not very frightened of people. Some are curious about us, even friendly. A few are spectacularly hostile. In later posts I’ll try to make some sense of their cephalopodic personalities. The next post will introduce some octopuses. A picture taken a few days ago, just after arriving in Sydney: a cuttlefish turning his den into a demonic cathedral. Later that day a storm came through, battering the shore with huge waves. The cuttlefish leave town when that happens, heading, I assume, to deeper water. We’ll see if this one returns. Posted in Cuttlefish and tagged Giant Cuttlefish, Whyalla. permalink. Wow! It looked like a trumpet fish right before it pounced.